Did you ever eat steel-cut oats? I never tried any until the last year or so, but have since really enjoyed having it for breakfast now and again. Actually, lately we have been having it pretty often. Before I ate any, I had never understood why or how they were different than regular (rolled) oats. Apparently rolled oats are steamed and then rolled, whereas steel-cut oats are just sliced a different way and not steamed. So they come from the same plant, but just processed a slightly different way. The picture below illustrates the difference pretty well. I like steel-cut oats because not only are they very healthy, they have a different texture and a nuttier flavor. What I don’t like is how long they take to cook. That is, until I discovered this recipe in Cook’s Illustrated magazine. Instead of putting them on to cook in the morning and waiting a good 20-30 minutes, for these you do one simple step the night before and cook a mere 5 minutes the next morning. Sweet! Here’s the recipe I’ve been following as of late and have found to be spot-on. With toppings added in, one batch usually makes enough to feed our family. The night before: Bring 3 cups of the water to a boil. Remove from heat and add in oats and salt. Place cover on the pan and let sit overnight. In the morning: Add in remaining cup of water and bring back to a boil. Reduce heat to medium and cook for about 5 minutes. Remove from heat and let sit for a few minutes before serving. We like to add our toppings in at the end. Some things that are good on steel-cut oatmeal: any kind of dried fruit, various nuts, brown sugar, cinnamon, chopped apples, milk, honey, molasses, or whatever else floats your boat! To mix it up a bit, you can also substitute fruit juice in for the 1 cup of water in the last step. 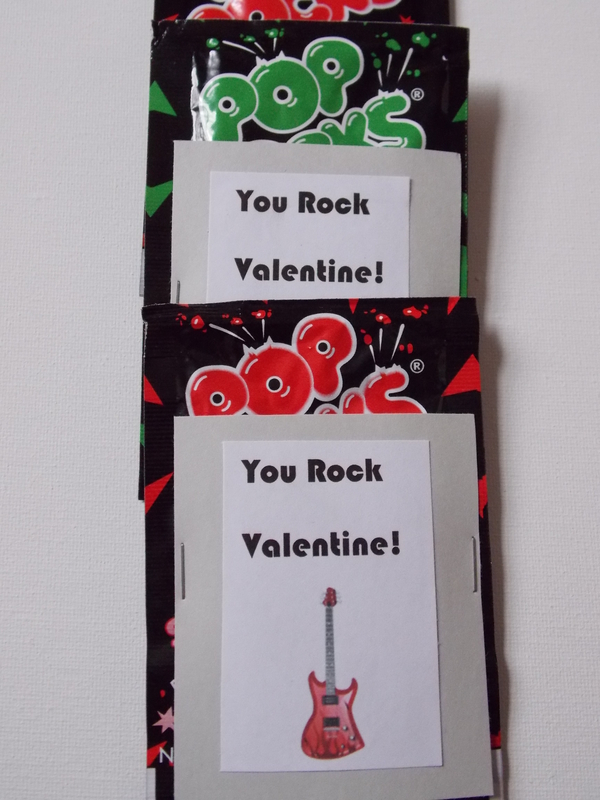 So this is a super simple Valentine idea using Pop Rocks candy. What kid wouldn’t feel mega-cool getting this in their Valentine box or bag at school? I know I would have loved getting this back in the day. All you need to make these are some Pop Rocks candy, your computer, paper, cardstock, glue, and staples. 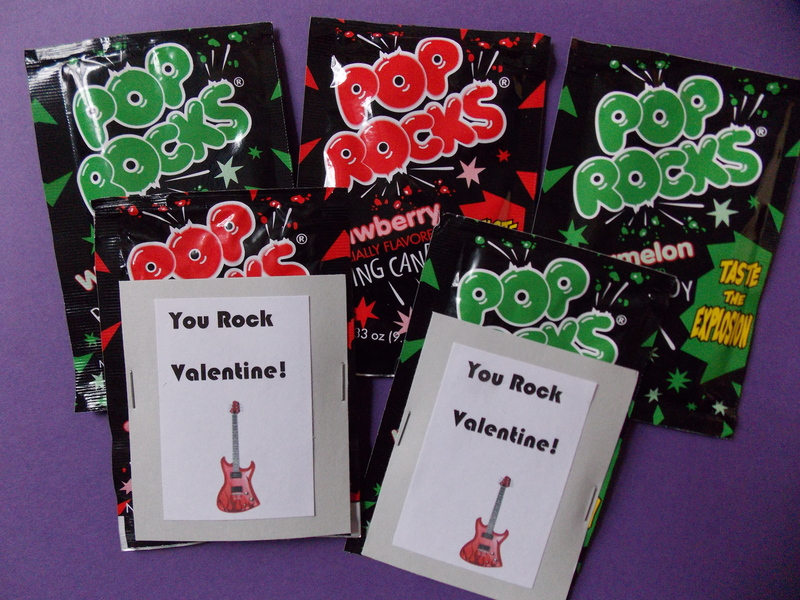 I printed out the words “You Rock Valentine!” in a font that I thought looked good with the whole rockin’ theme, along with a clip art guitar. 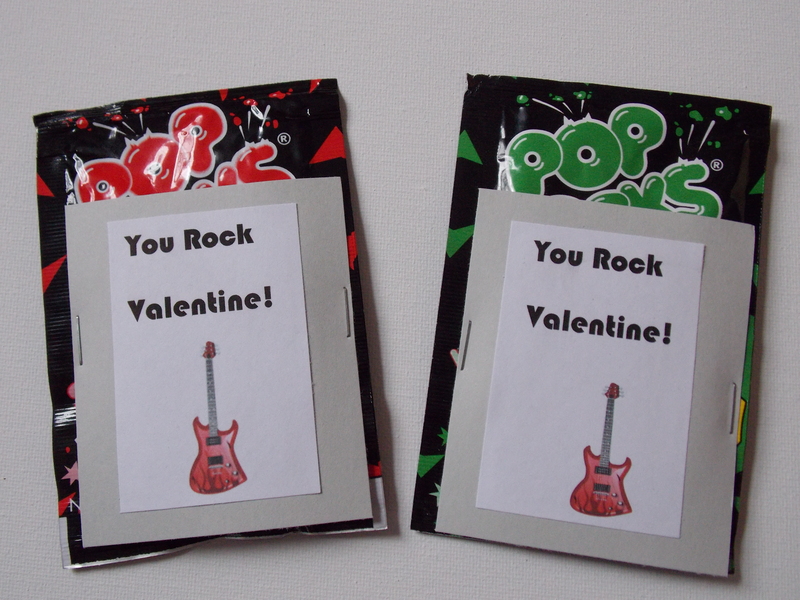 After printing them out, I simply glued them to a rectangle of cardstock and stapled the whole thing to the actual package of Pop Rocks. That’s basically all you need to do! 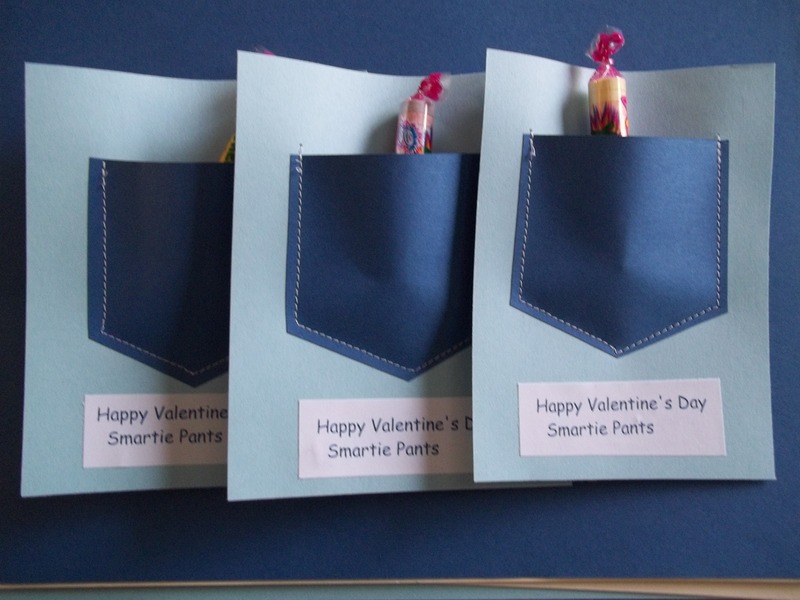 I’m planning to come up with a few more fun Valentine ideas as my kids haven’t done any for their classmates yet. Happy Monday everyone! I drew this one out of my archives as it was one of my favorite Valentines to make last year. 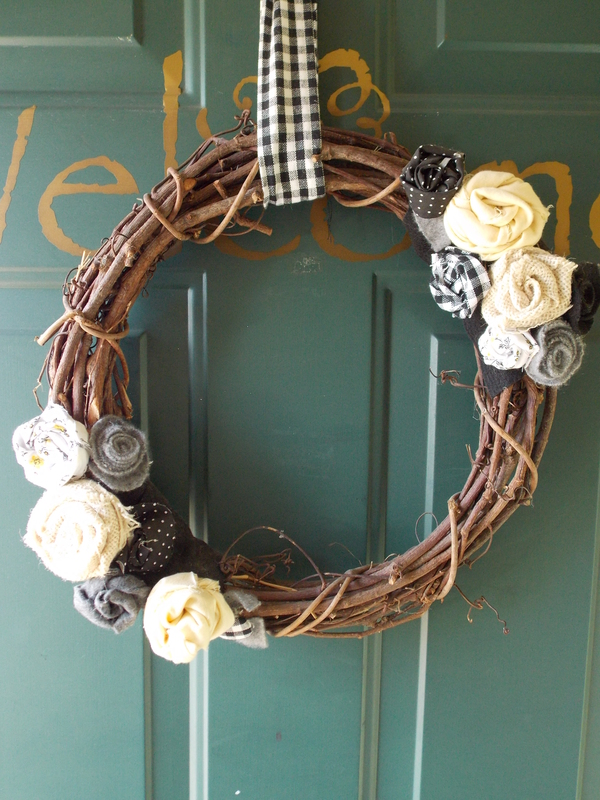 It’s also one that gets “pinned” on Pinterest fairly often, so I thought I’d give it a second showing. 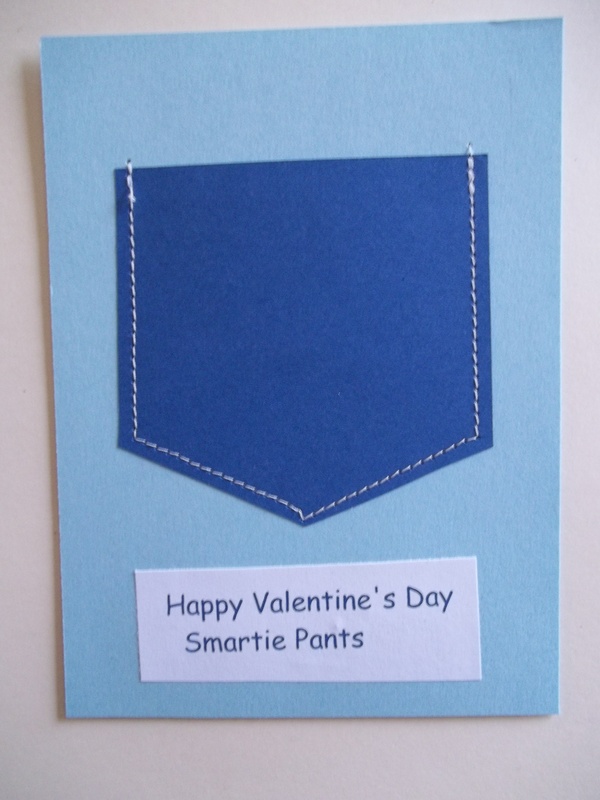 I like this Valentine because it could be suitable for a boy or a girl. 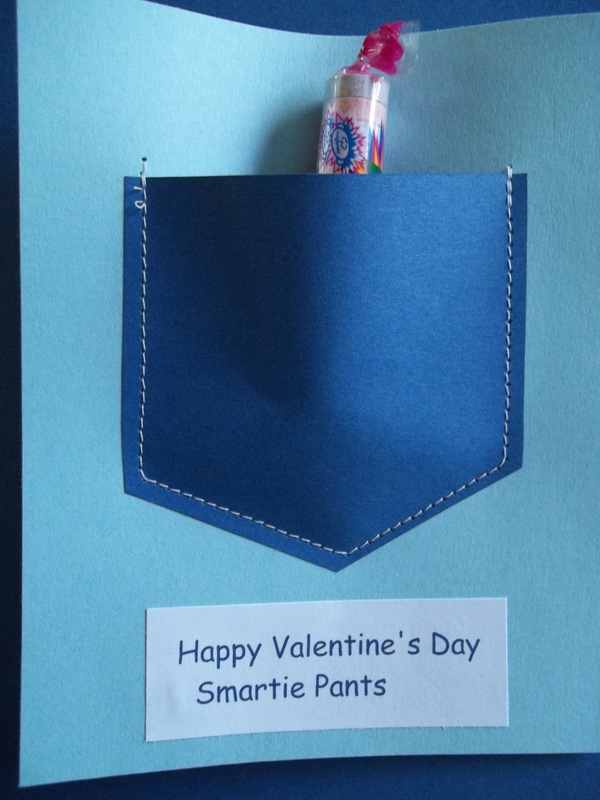 Our house is a bit outnumbered with boys, so I thought this may be appropriate for one of my guys to give as Valentine’s for their class. 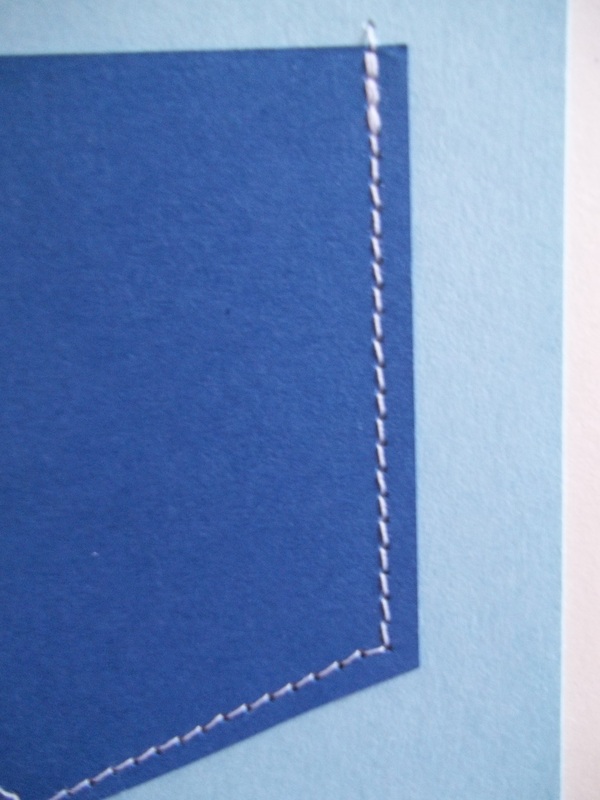 I cut out large rectangles in a light blue color of cardstock. 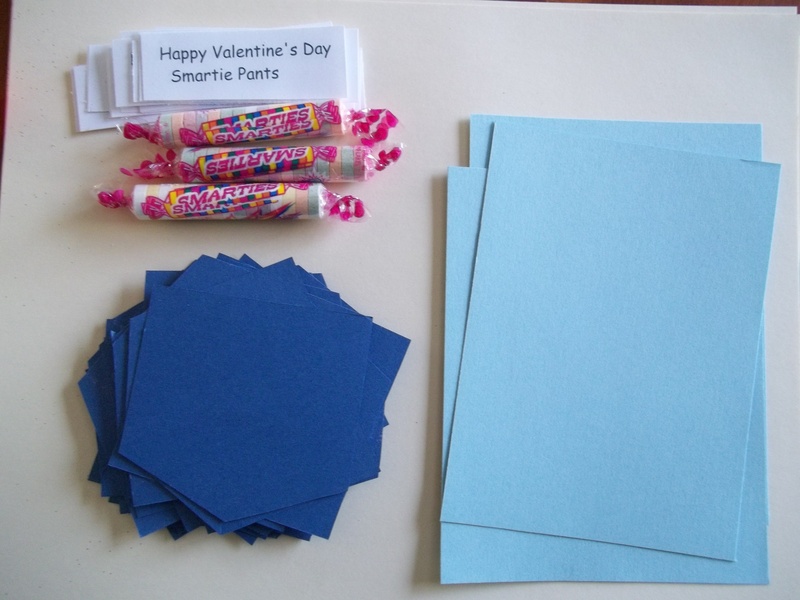 Then I took a darker shade of blue, made a template, and cut out a corresponding number of pocket shapes (they have to be large enough to hold a package of Smarties). On my computer, I typed out a simple document with the wording and printed it also in dark blue. 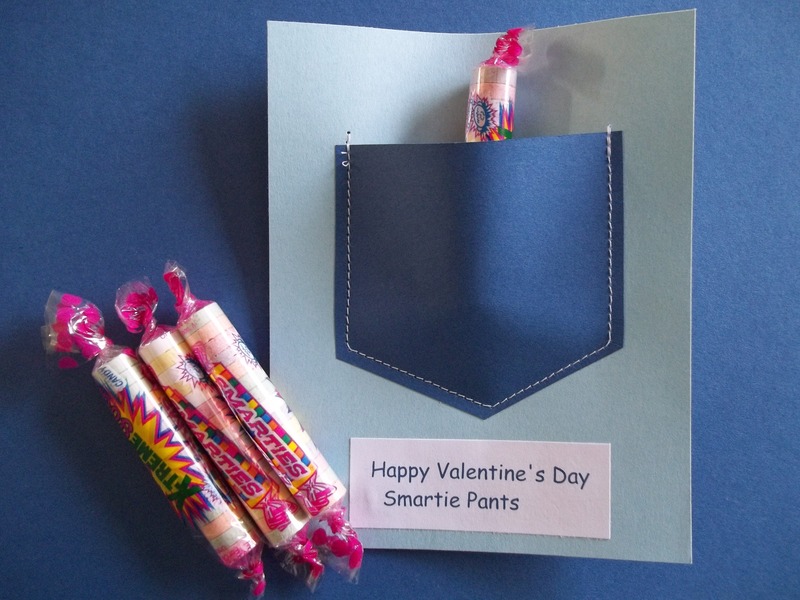 Pop in a pack or two of Smarties and you’re good to go! 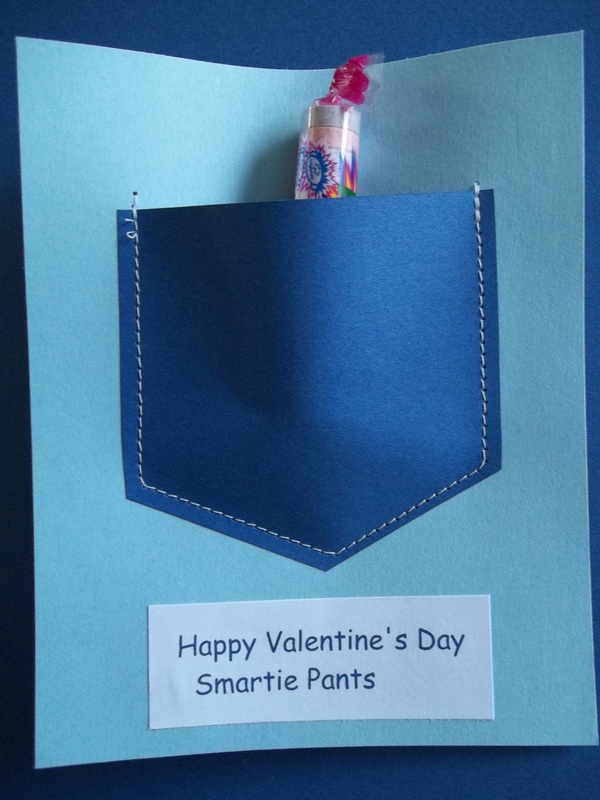 PS-This post is dedicated to my Mom, who never fails to have a pack of Smarties for her grandbabies. In fact, we considered it a milestone for each kid when they figured out which pocket of her purse her “stash” was in and tried to help themselves. Thanks, Mom–maybe that’s why I have such a bunch of Smarty-Pants kiddos now. Right now this is the meal my kids request the most often. Usually I make a batch every other week and it gets all eaten up in one sitting! I didn’t put this on my Christmas post, but my husband bought me a larger crock pot, per my request. We had the same one for years, which went largely unused until this past year. 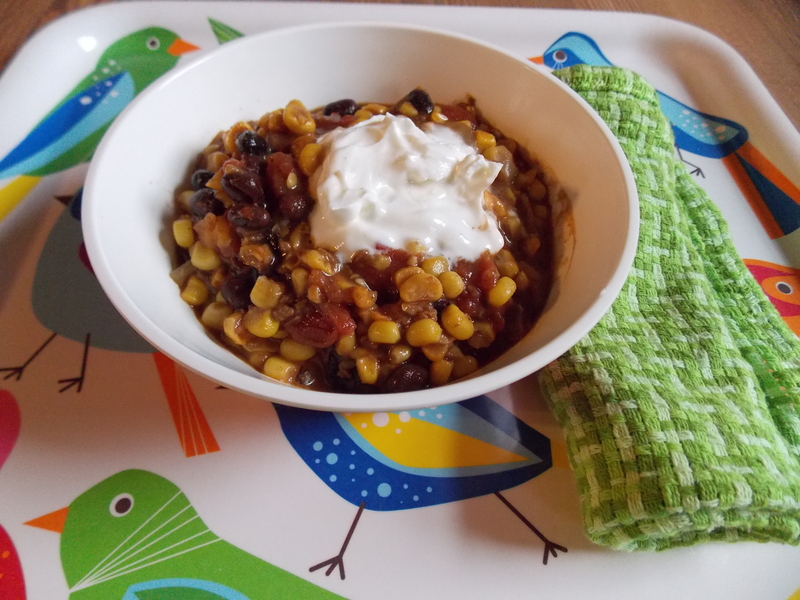 I’ve been trying to do more meals in the slow cooker and have made an effort to expand my repertoire. With our large family, I really wanted something a bit bigger, so this new one is working out great. 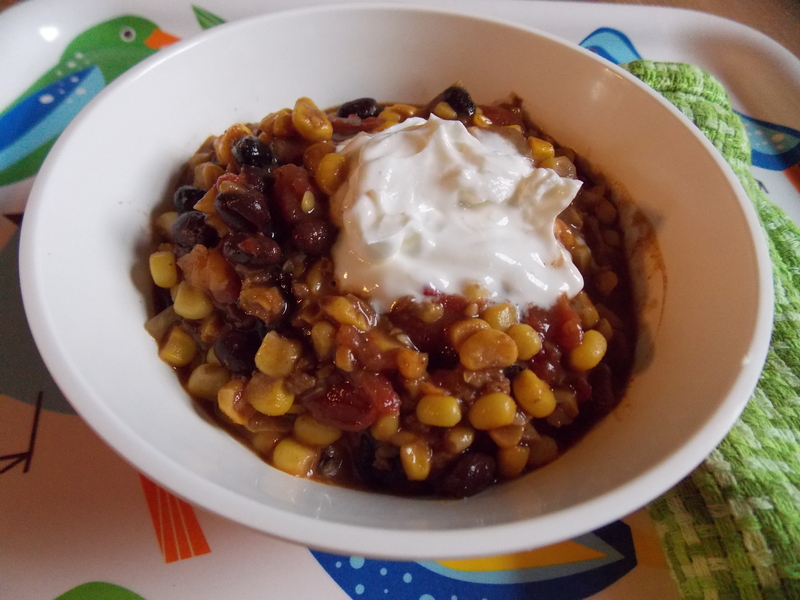 To the thrill of my crew, I made another (bigger) batch of this the other night in my new slow cooker, so I actually had a bit of leftovers to photograph! 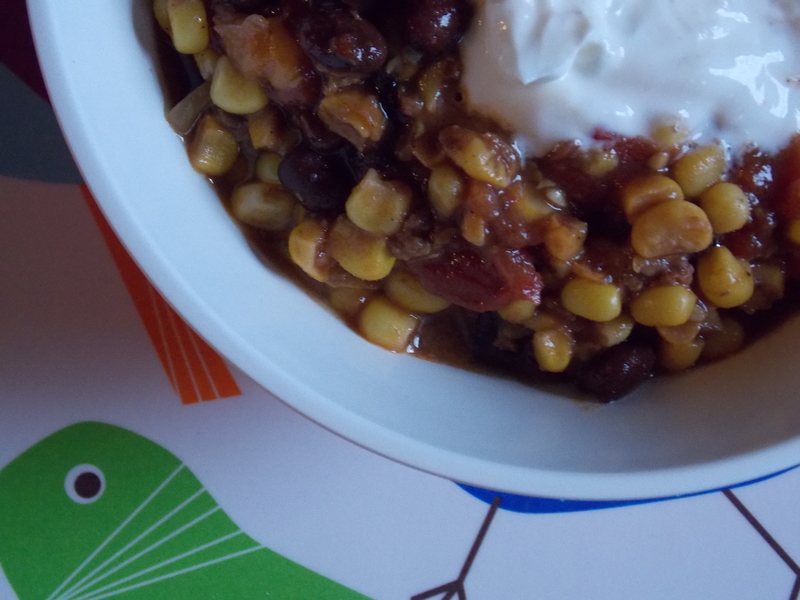 It has lots of good stuff in it and is actually a fairly healthy dish. With the addition of a little shredded cheese on top, sour cream, and some good nachos, it’s a complete meal. Brown your ground beef along with the onions. Add in the taco seasoning during the last minute or so. 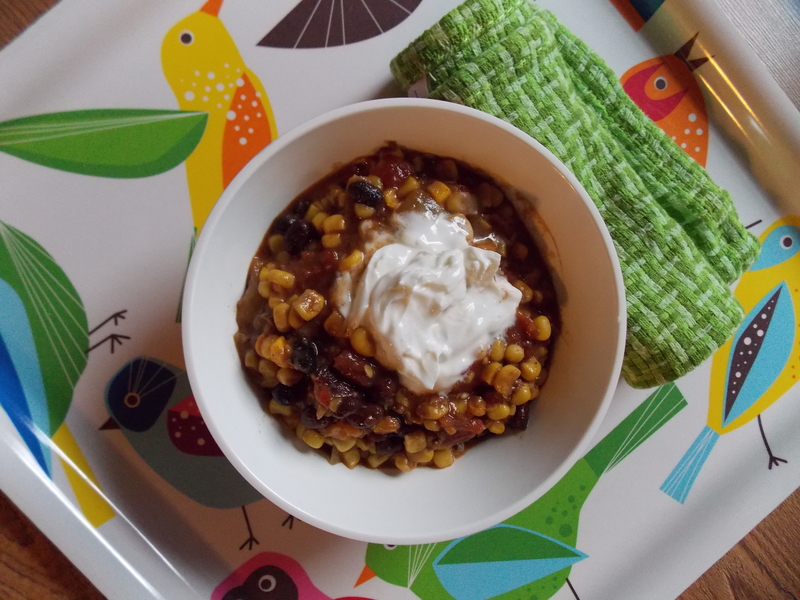 Place in the slow cooker along with the rest of the ingredients. Allow to cook for a few hours. I sometimes put it on high for about an hour, then turn it down to low for the remaining time. Season up however you would like. I add a little bit of extra spice, then set some out if anyone would like to heat theirs up more. Yesterday I tackled a task that I admittedly don’t do often enough. 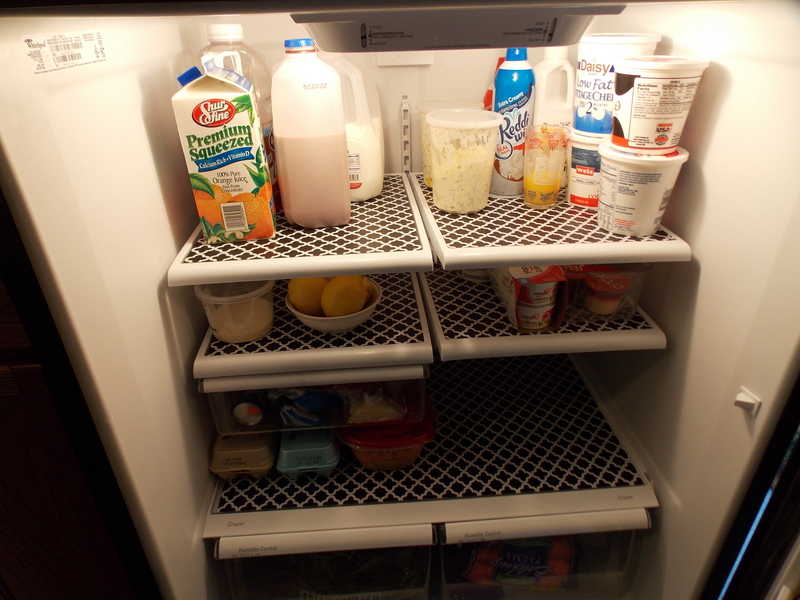 I emptied out my fridge entirely, pulled all the shelves out, wiped everything down, and got rid of some old or questionable food items. Then I added a little somethin’ to pretty it up a bit. Believe me, these are much prettier than my “before” pictures. 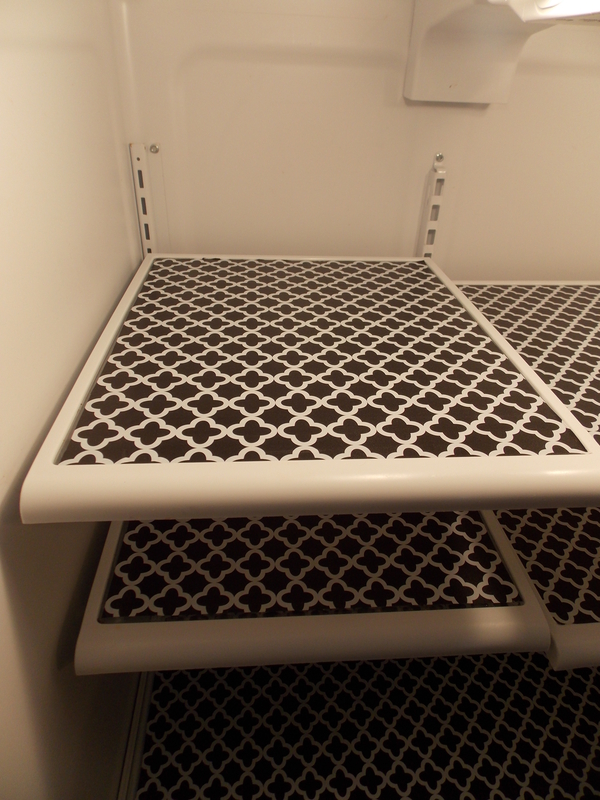 Not only is my fridge grime-free, it has this cute black and white patterned liner on the shelves. 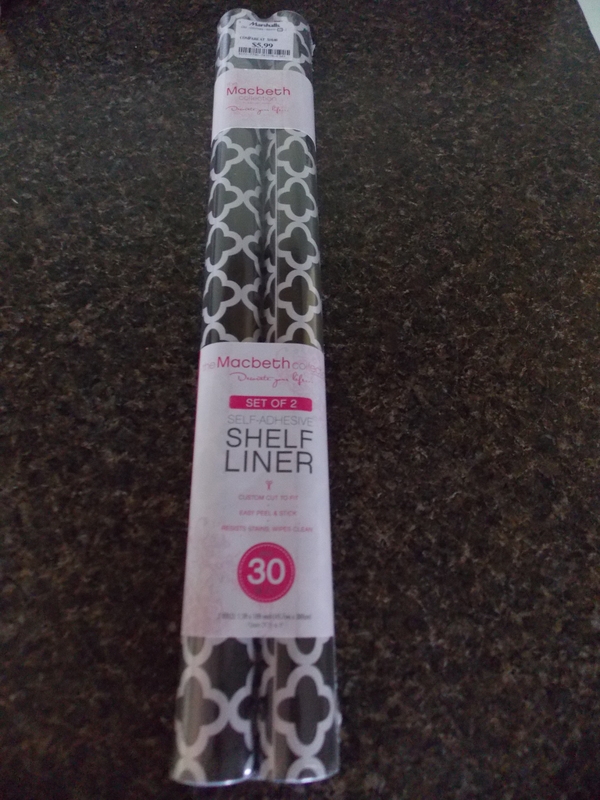 I bought this 2 pack of shelf liner at Marshall’s for about $6. (I only used up part of one roll for this project, so I can do a lot more with that pack!) They had a few cute other options, but I didn’t think my man would be too wild about hot pink or turquoise glaring at him every time he opened the fridge. The sweet part about this is that it can be wiped down and has nice graph-like lines on the back so I didn’t get too off-course with the cutting aspect. After wiping down each shelf thoroughly and letting them dry, I cut out the liner according to size and carefully applied each one. 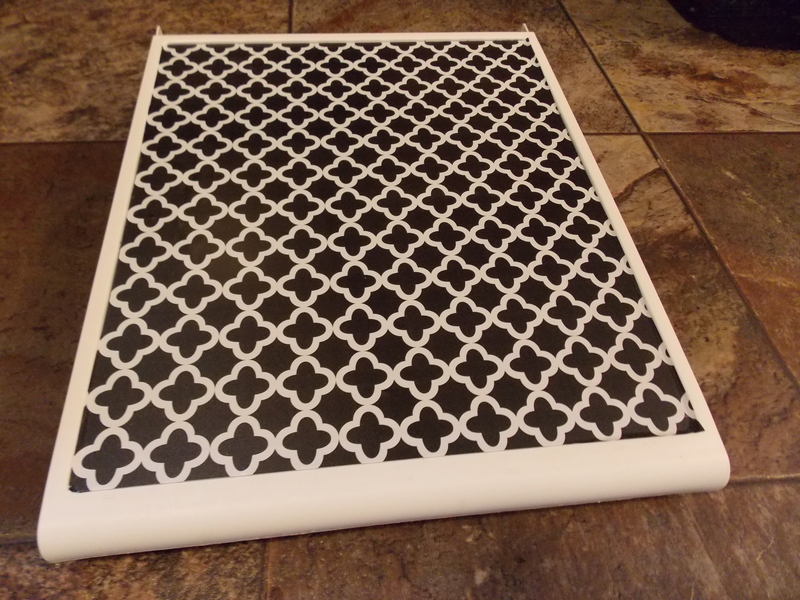 It was pretty easy, though I did get a few air bubbles that needed to be worked out. 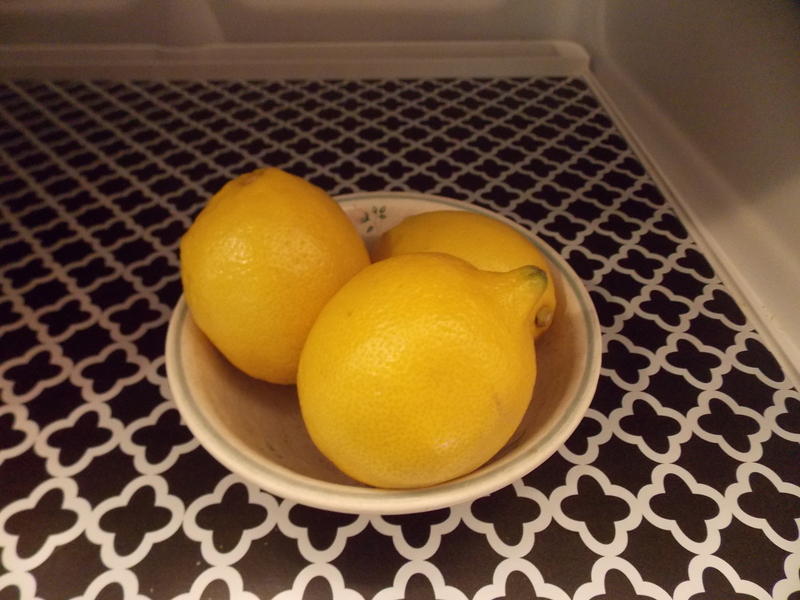 I discovered that you can peel these back up if needed, which is a good thing! 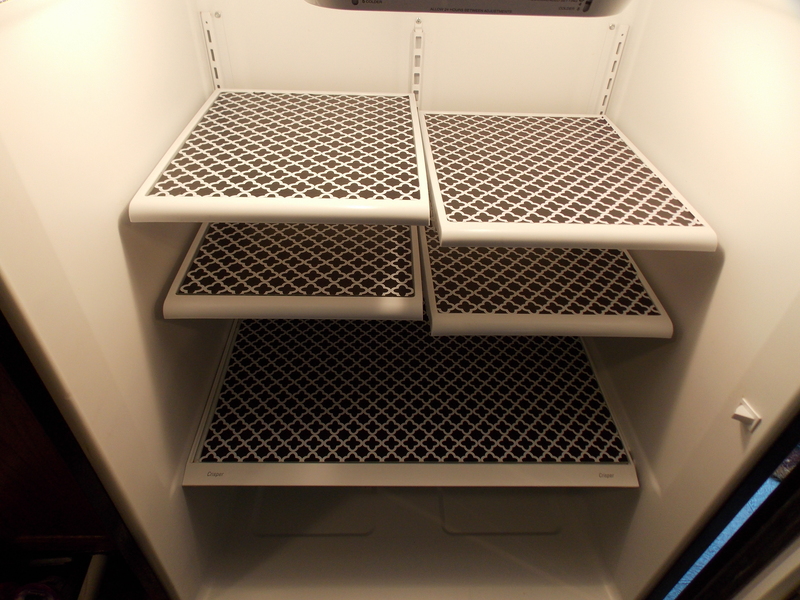 After putting everything back in place, I am enjoying my like-new, pretty refrigerator. Whew! It was a relief to get my Christmas stuff put away last week. The house seems a bit more spacious and, well, a little less cluttered. This time of year always makes me want to purge my home of unnecessary clutter and organize even more. In fact, I just told someone the other day that I truly felt like I could rid our home of half of our belongings and we would still have plenty. Anybody else with me on that one? 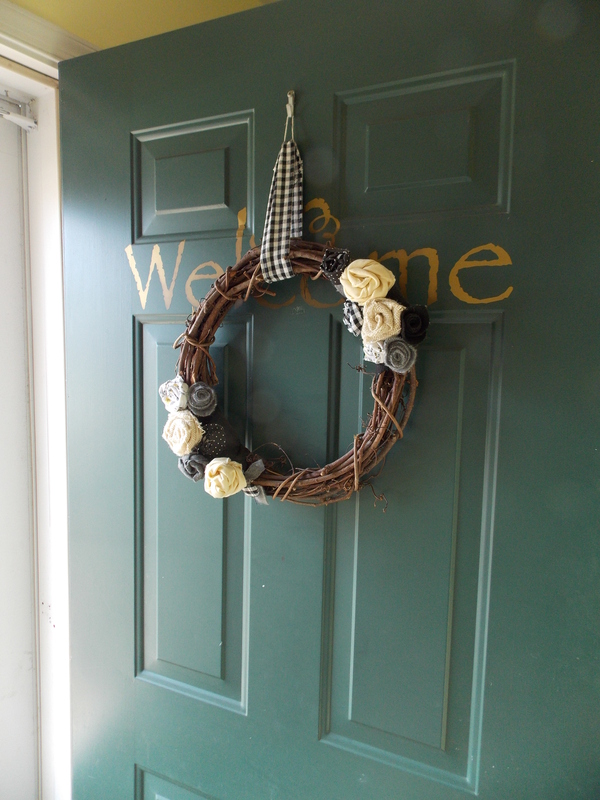 Anyway, today I thought I’d share what I just hung on my front door now that Christmas is behind us. I actually made this well over a year, maybe a year and a half ago. I think I even put one photo of it on a blog post, but didn’t feature it at all. 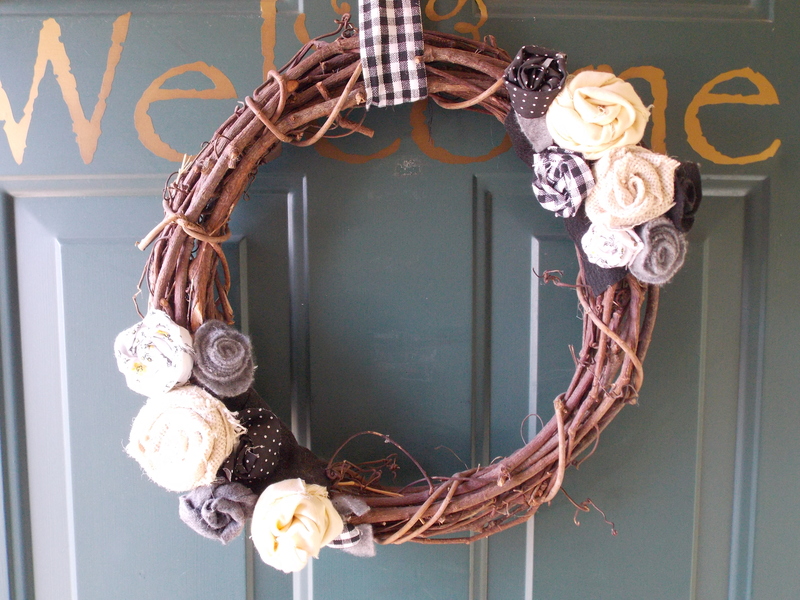 As you can see, I took a simple grapevine wreath and chose a color palette of black, white, gray, and yellow. 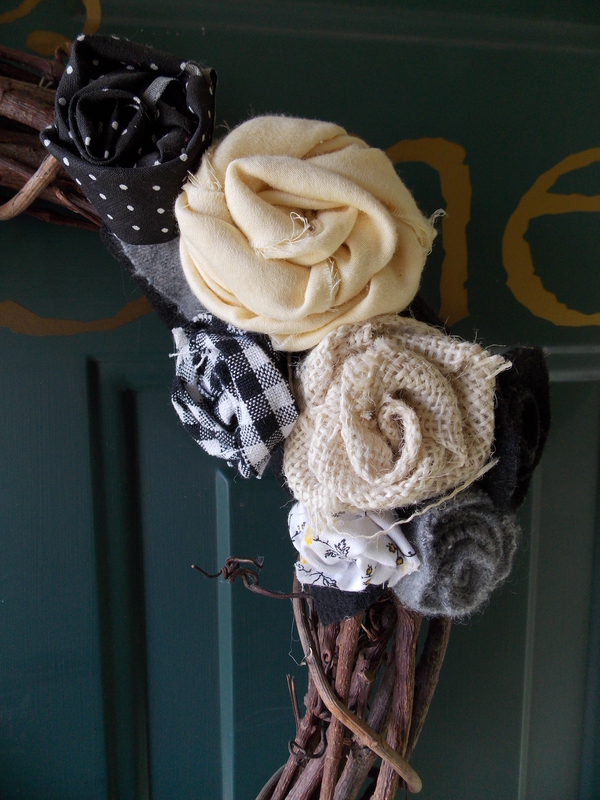 Then I made up a bunch of flowers and rosettes using various fabrics that had these colors. 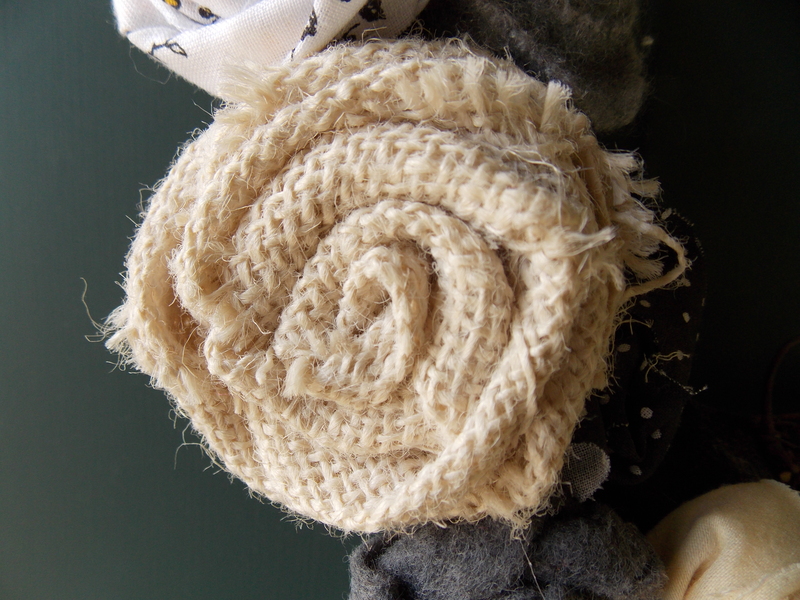 I ended up with burlap, black and white gingham, several patterned cotton fabrics, and a gray cashmere thrifted sweater. For the hanger portion I took a length of the gingham and sewed it into a basic long rectangle, then added a bit of twine to the top. I’m not sure if this is totally wintry, or seasonable, but I like it nonetheless. Is winter drying your skin out already? It seems to be doing a number on mine already, and I tend to notice it most on my face. You may know what I’m talking about–those dry, flaky areas that seem to crop up when the temperature drops outside. I was absolutely thrilled to find this post on A Blossoming Life recently. It uses coconut oil and baking soda, two ingredients I always have on hand anymore, so I tried it out. LOVED it. It definitely made my skin feel much softer and smoother. All you do is take about 1 tsp of baking soda and mix it with 1/2 to 1 TB of coconut oil. Wet your face with warm water, then scrub the mixture in, rubbing in little circles all over your face. Wash with warm water and you are done. I wouldn’t do this every day, perhaps once or twice a week.